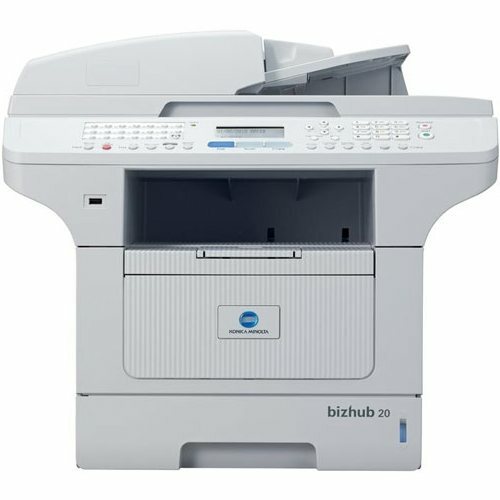 For a machine that can print, copy, scan, and fax, the Konica-Minolta bizhub 20 is not overwhelming in size and will fit in an office with limited space. Weighing just about 40 pounds and measuring approximately 21x18x19 inches, this monochrome laser all-in-one is able to be stored on a standard table or desk. Besides combining multiple functions in a single device, the Konica-Minolta 20 is also network-ready, meaning multiple users can share it. As many as 32 pages per minute can be printed, which should be a sufficient rate in most office environments, equating to less than 2 seconds per page. When the unit is first turned on, it can take a little less than 20 seconds to warm up, and the first page printed will take around 10.5 seconds. The copier operates at about the same speed, while the scanner can process about 20 scans in a minute. The Super G3 fax transmission allows faxes to be received in as little as 3 seconds. As a monochrome device, only black Konica-Minolta 20 toner is used during operation. This printer toner can render a resolution of up to 2400x600 dpi when printing and 1200x600 dpi when making copies. 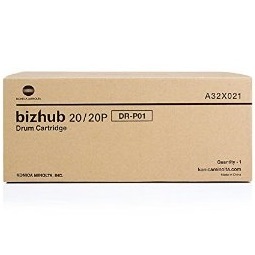 Each bizhub 20 toner cartridge can yield up to 8,000 pages, keeping the cost per page relatively low. Replacement toners are readily available from various reputable vendors online. Comparative shopping will ensure the best prices for replacement Konica-Minolta 20 toner. Windows and Mac platforms are both supported by the 20, and users have a few different connection options. As previously mentioned, users can share this machine through its ethernet interface, but computers can also connect via USB or parallel ports. A front-loading USB host port is also available, allowing users to print documents and images directly from a thumb drive, or save scans directly to it. Memory can be upgraded from the standard 64 MB all the way up to 576 MB. Paper capacity is also expandable from 300 sheets to 550 sheets with the addition of an extra tray. A duplexer allows for dual-sided printing and the automatic document feeder is used to continuously feed pages to be scanned or copied. This device collates printed documents, has a monthly maximum duty cycle of 30,000 pages, and offers a Toner Save mode to reduce the amount of bizhub 20 toner used per print. This compact and versatile office machine will conserve space, time, and money. It provides the necessary speed and quality for a professional environment, and has high-yielding Konica-Minolta 20 toner cartridges to keep its operation costs low.